“The production in subsistence farming has increased due to good health enjoyed now after project implementation and the increase in work force or labor force,” said community member Henry. 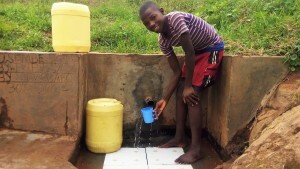 A year ago, generous donors helped build a spring protection and sanitation platforms for the community surrounding Musembe spring in Kenya. Because of these gifts and our monthly donors, partners are able to visit project sites throughout the year, strengthening relationships with communities and evaluating the actual water project. These consistent visits allow us to learn vital lessons and hear amazing stories – we’re excited to share this one from partner Jonathan Mutai with you. Musembe spring implementation has changed the lives of the community members as waterborne diseases that used to be a threat are now a thing of the past. 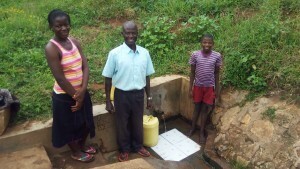 Community members drawing water from this spring are now enjoying good health as they are accessing safe and clean water for drinking and for general chores. They are now investing their resources in the right way unlike before where they could spend their resources in seeking medications rather than development. The project beneficiaries still need improvement in water handling to ensure that the current clean water accessing from the protected spring are maintained clean. Also operation and maintenance of the facilities needs improvement as the staff we will conduct monitoring and evaluation to ensure that the facilities serves the intended purpose. 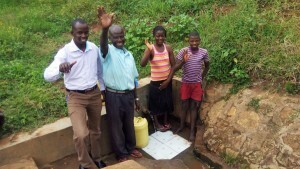 This spring protection water project has greatly helped the community members. They are now enjoying safe and clear water for drinking as well as for the general use. The community members are welcoming and hardworking people, their environment looks conducive as they do planting of trees that beautify their environment and bringing good breeze. 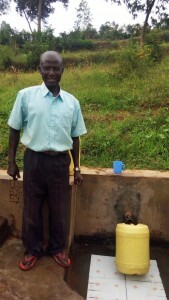 When you invest in The Water Project, you're investing in people like Henry Musemi. Your gifts help us reach more communities with the gift of clean, safe water. And every drop helps unlock potential.